C. 15:33 was born of a meditation on the concepts of the flicker, electronic representations of biological systems, and light as pure information. That the whole of existence is a networked system of unique elements—themselves comprised of networks of unique elements—necessitates an approach to reality that views events in terms connections and relationships. The way in which visitors interact with C. 15:33 is scripted such that local actions can be seen as having global or system wide influence. 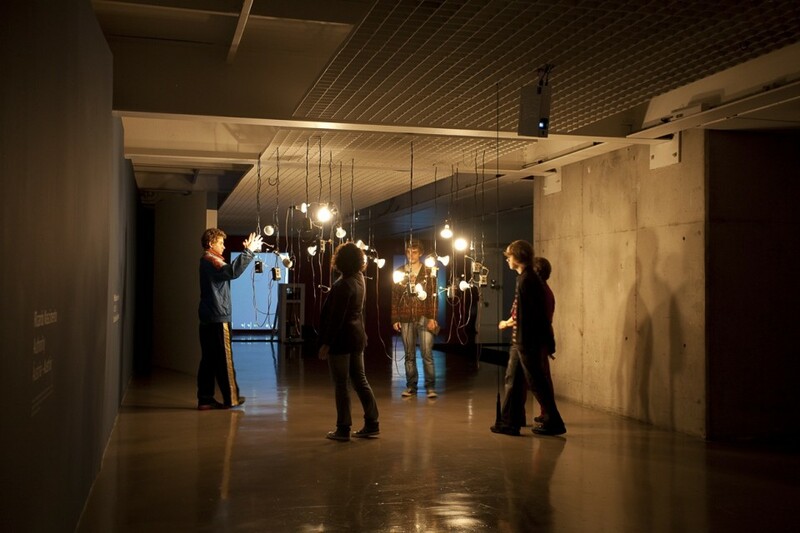 As visitors approach C. 15:33, they are presented with a constellation of gently pulsating lights connected by a sprawling web of wire suspended from the ceiling. The structure is vaguely reminiscent of depictions interconnected neurons found in science text books. 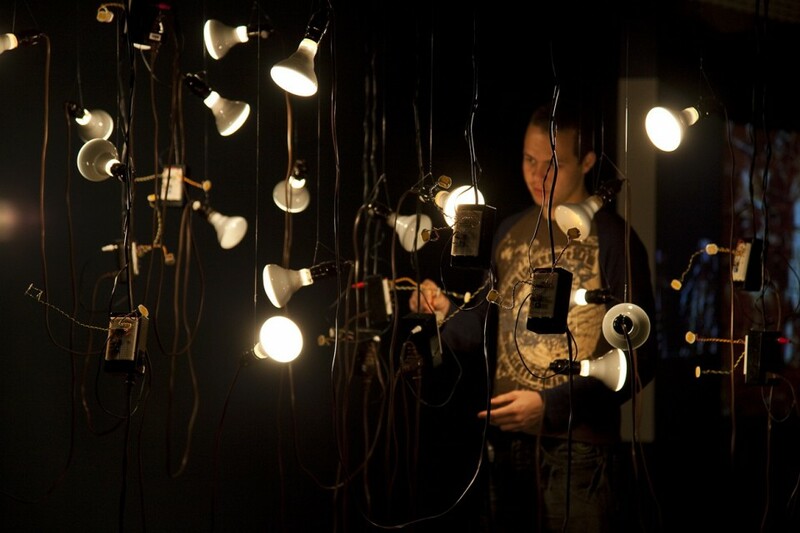 The light bulbs are spaced apart, inviting the visitor to enter the space of the work. As the visitor moves through the hanging lights, their presence noticeably alters the way in which the lamps flicker and strobe. Their movements are translated into ripples of light, pulsing and flashing in evolving patterns. What is not immediately clear is that each one of the light bulbs is part of a single, unique individual within a network of binary relationships. Each individual is modeled after a biological neuron and consists of four sections: input, summation, threshold detection, and output. Inputs are take from two photo sensors and summed together with an operation amplifier. Threshold detection is done with a comparator circuit which controls a relay attached to the lamp. In other words, the total amount of light collected by two photo-sensors determines whether or not the connected lamp or lamps is on or off. As one light turns on, it effects others, causing some to turn off and others to turn on. This in turn causes a cascade of reactions to propagate through the network of lights, turning local interactions into system-wide change. Connections between the elements within a network define its topology and the behavior of signal propagation through it. In C. 15:33 the connections between network elements (“neurons”) are made via light across some distance. Because total the level of light determines which lamps are on and off, the system becomes equilibrium seeking; the exact topology of the network combined with its previous state determines whether equilibrium is reached or whether dynamical and generative patterns emerge. Because the movement of the visitors through the installation is registered by light sensors, by blocking light from reaching the sensors they are essentially altering the topology of the network. Their movement is registered and encoded in a dynamical and evolving progression of flickering light. 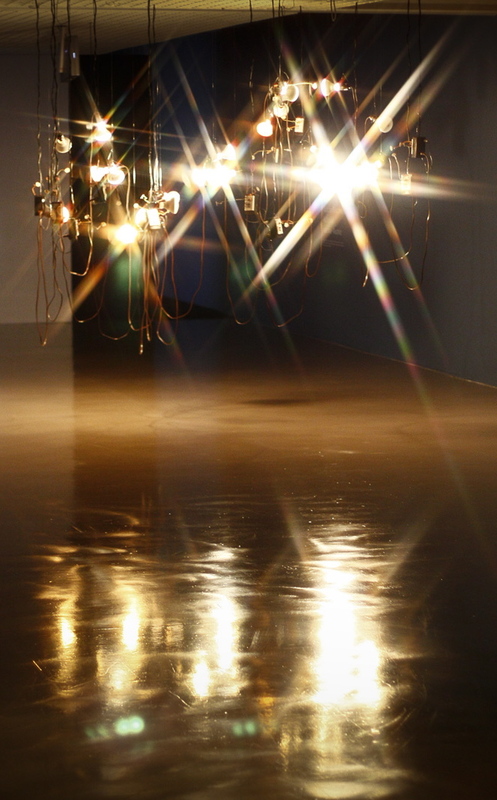 The resulting experience is of being immersed in a constellation, bathed in softly pulsing and flickering light that ripples throughout the space, oscillating from soothing steady states to stroboscopic chaos. Playfulness, exploration, and discovery are encouraged through the interactive translation of movement into very immediate, tangible and yet slightly unintuitive shifting patterns of flickering light.